Do we use the term more casually than in years past? 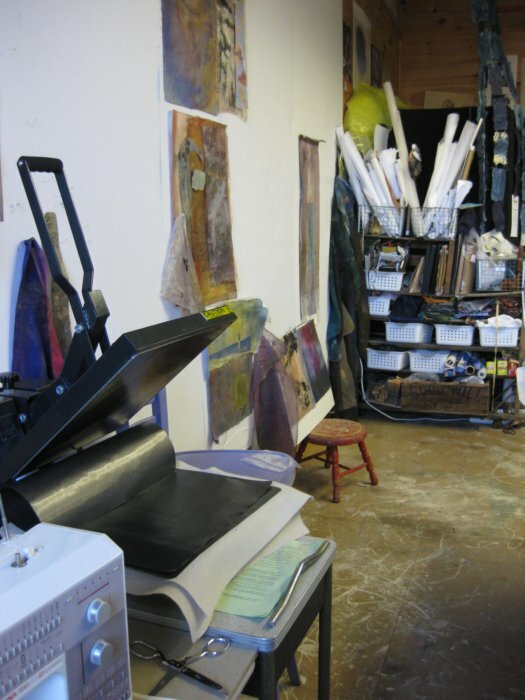 Does an art degree make you an artist? Or do you become an artist by degrees. Step by step, inching closer. Taking it all in and letting it out. Developing an Eye and then always seeing. Listening in on our whispering muse, we hone our voice to honor our soul. How do you define artist? Is it when time melts? When you disappear into the flow, revealing. When can you tell you hear your authentic voice? Is it when you step back to listen? Moving out of the way, you can dance. Is it when you remember to remember? This question, art and balance, plagues female artists more than male. We, who need to divide our lives into segments, are more vulnerable to the judgements and cultural influence than men. In the past, I think, women had to give up having the "traditional" family situation to devote their energies to the art. And it does take an enormous amount of energy. Now we have more options. Sometimes TOO many! I was lucky enough to be able to raise my children without having a second job. It was in the 80's when this was very untrendy. It was thought to be a cop out on the advances of women in the work place during the late 60's and 70's. Without dishonoring those said advances, I felt that the job of raising children was just as important! Our society does not compensate the at home parent with social security- which it should. I also feel that Child Development should be a required course in schools. Knowing what a child is capable of will help cut down on child abuse, which then affects the following generations. Anyway, off my rant, art for arts sake is something I must do. I feel out of sorts when I don't do it. It feeds my soul not only in the process of making it but wanting to capture what I feel and see when I go for walks, read a poem or even get inspired by someone else's creativity. I am coming off of 20 plus years of selling my art with vigor. I've been taking it viva 'booth et all' to shows for the last 6 or 7 years. I will take 2012 off. I may not take my work on the road again. I am going to taste teaching this year. Then gestate. Decide. Rethink. Balance is not my forte'. I struggle with it. 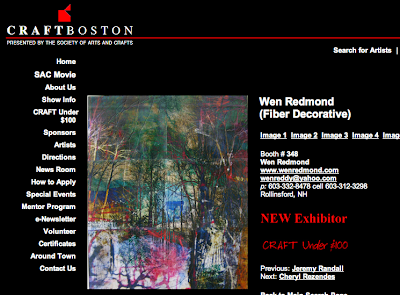 I will be exhibiting at Craft Boston- a very fine art and craft venue. I'm in booth #348, toward the rear. Sure hope you can make it! In 2007, I took a four-day workshop with Susan Hammond West at the Surface Design Association Conference, held at that time, in Kansas City. The workshop, called "Art as Quiet", began with each day with a meditation. 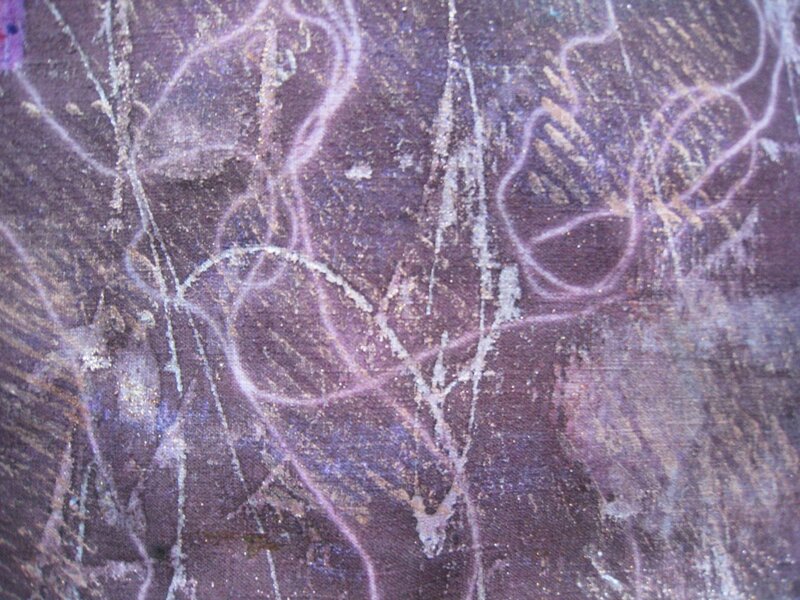 Susan Hammond West is a painter and mixed media artist with a hunger for experimentation. She combines art making with the energy of Buddhism and Yoga philosophy. Susan’s work is simple in appearance and reflects her inner serenity. It's simple with barely tangible circles and organic shapes surrounded by large quantities of space. Her works expands beyond the rectangle to present in attached free constructions of numerous sizes. She uses paint, molding paste, assortment of fabrics, industrial felt and even stitches with copper wire. I told her that it was ‘intense simplicity”. Years later, I can still feel her energy in her work. Simultaneously, Sue had an exhibition in Kansas City during the conference. 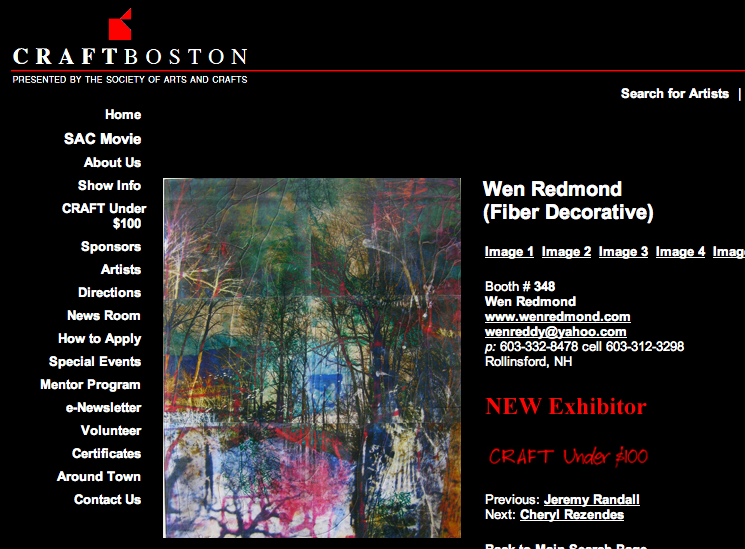 There are so many exhibitions and vendors that I call these conferences ‘fiber heaven’. Currently chair of the Visual Arts Department at Naropa University, she teaches and researches contemporary and ecstatic art forms, and how to infuse art with a palpable haunting presence. “Art is an open form of communication that evolves powerfully in a supportive environment. Here a vibrant space is held for something extraordinary to happen. 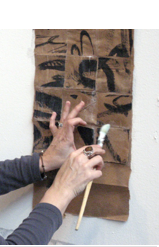 Through art making the student discovers their own self-reflected consciousness. 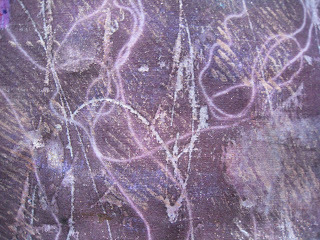 Recently I visited a blog having a discussion about how printing on fabric is not creative. When things went digital, my work expanded ten-fold! I could do so many more things than I ever dreamed of. I married my interest in photography with my love of fiber. I think working digitally IS a creative tool. Not only must you have an eye and take intriguing photographs. You need to know how to interpret this into fiber, then your vision can show. You can then leave the photo as is, manipulate it in a variety of ways ( much like you could do in the darkroom), layer them, fuse them with other photos, tile them, collage photo's, draw into to them using a digital pencil. And more. It is a vast field. Not to mention deciding how to print them. What cloth or paper to use. Add a digital underpainting, or not. Print on painted or plain substrate. Print on a collage made from cloth, paper, or tea bags. Endless! THEN when they are printed, you can go forward with creation. Stitching, adding mediums. collageing, layering with transparent media. Cutting apart and re-sewing- any number of options. Photo Shop tools are digital paint brushes! It is a very creative technique- much as any surface design technique is! You can take it and run with it! "It's how the artist uses the media to interpret the subject matter that makes it art - not the media used to get there." Someone recently wrote to me asking me what I use for my design wall. I wrote that I have two- one on each side of my studio. I used several 4'x8' sheets of light weight insulation boards that I brought from a local hardware mart. It's about 1/2" or so in depth. Easy to transport or even cut with a utility knife. One is covered in wide flannel, that I think I bought from Hancock Fabrics. The other one is painted white. I use this to pin into/ hang work, and as another gallery wall during Open Studio events. But I also enjoy painting vertically- like painters do using easels. When I do this, I cover the painted wall with 4 ml painters plastic. Tape my fabric and paint away. This is just the ticket when I don't want to lean over my work at a table. Another trick I find handy, is to cover 20x30 foam boards in plastic or better yet, kitchen bags. Lay on my fabric and paint on those. Then, I can take them to a drying rack or floor area to dry. This is really handy when I do sun printing in fair weather. I can paint, take the fabric supported on the covered foam board and simply slide it off outside. Add my items to sunpaint and run back inside (or on nearby picnic table in the shade) and paint some more!! I reuse my foam board with another plastic bag. I save the bags to use over and over!